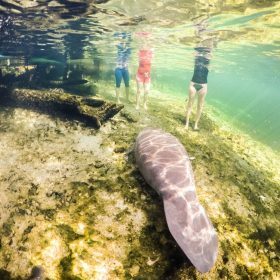 Blue Springs is home to Manatees, Fish (Gar Tilapia), birds, the occasional boar, deer and alligators. There is a large swimming area to relax and cool off in. 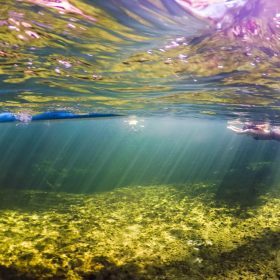 You can paddle all the way up to the spring head and snorkel around the 80ft deep “boil”. Apr. – Nov., early morning or late afternoon. 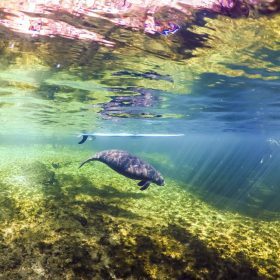 Blue Spring closes to become a Manatee Sanctuary in the Winter. When open for swimming, paddleboards (also kayaks and canoes) are allowed in the run before 11 am and after 5 pm. The park frequently reaches capacity in the summer and the swimming area fills up quickly. We recommend going early or during a week day. You can enter Blue Spring State Park and launch from there. Keep in mind paddleboards, kayaks and canoes are only allowed in the swimming area before 11am and after 5pm. For park launches, we recommend driving past the first parking lot (on your right) to the one closer to the river. There will be less distance to walk to the launch point, and you can launch onto the river there any time the park is open. It’s about 200ft to get from the parking lot to the swim area. No fees to launch at the French Landing boat ramp. If you enter Blue Spring State Park, it’s $6/vehicle of up to 8 people, $4/vehicle single-occupancy. One mile from French Landing to spring head. 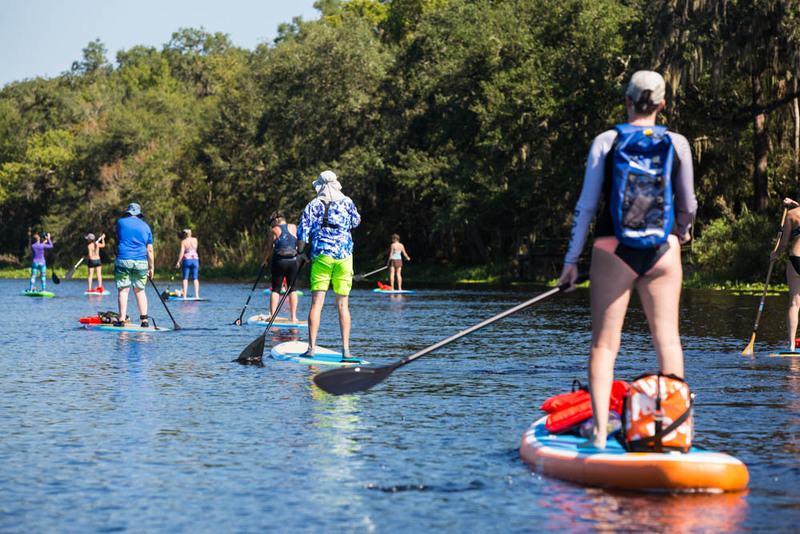 The U.S. Coast Guard (USCG) has classified a paddleboard as a vessel; all users are required to have a USCG-approved Personal Flotation Device (PFD). Children under the age of 6 are required to wear it, while paddlers over the age of 6 must simply have it on the board. Paddlers are also required to have a whistle or other sound-producing device. 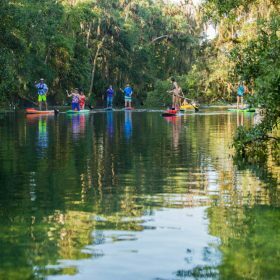 *If you’re looking for a longer paddle in the area, a mile SE of the entrance to the Blue Spring is “Snake Creek”. 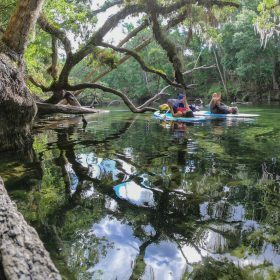 It’s a very narrow waterway that takes you through some beautiful Florida jungle! Keep in mind, it’s common to see large gators on the St. Johns River. Use caution and good common sense! 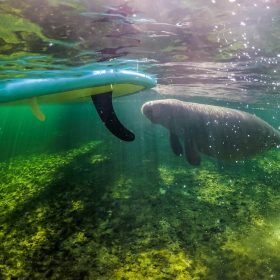 This entry was posted in Beginner Paddle, Stand Up Paddle Boarding and tagged SUP.